Liverpool revived their ambitions of claiming the Premier League title in remarkable fashion as they humiliated champions Manchester United at Old Trafford. Sir Alex Ferguson's side looked on course to stretch their advantage at the top of the table when Cristiano Ronaldo's penalty gave them an early lead after Liverpool keeper Pepe Reina fouled Ji-Sung Park. But Fernando Torres hounded Nemanja Vidic into a mistake eight minutes later and raced through to coolly beat Edwin van der Sar. And the transformation was complete a minute before the interval when Steven Gerrard scored from the spot after he had been upended by Patrice Evra. United's day of misery was summed up 15 minutes from time when Vidic, who had a nightmare afternoon at the hands of Torres, was sent off for fouling Gerrard and Fabio Aurelio brilliantly curled home the resulting free-kick from 25 yards. The torment for United stretching into stoppage time when Liverpool substitute Andrea Dossena lobbed a composed finish over Van der Sar after being allowed to race unchallenged on to Reina's goal-kick. United remain firm favourites to claim the Premier League, with a four-point advantage and a game in hand, but if Liverpool needed any incentive to continue to carry the fight to United, the impressive manner of this performance will have provided it. It has been a dream week for Rafael Benitez's side, with both Real Madrid and United put to the sword with four-goal performances. Liverpool, once they found their feet, were the brighter and more creative side - with the magnificent Torres the spearhead, ably assisted by Gerrard. The Premier League leaders, in contrast, were lifeless in all areas as they suffered their heaviest home defeat since losing 4-1 against QPR on New Year' Day 1992. They were unsettled at the back and toothless up front with Ronaldo and Wayne Rooney unable to make their presence felt. United must now bounce back from a defeat that was unexpected, both in style and scoreline, while Liverpool will move forward with renewed optimism that they can still over-turn the odds and catch the pace-setters. Liverpool had already lost influential midfield man Xabi Alonso to a calf problem when their difficulties increased in the warm-up, Alavaro Arbeloa injuring a hamstring with Sami Hyypia coming into the side, though the veteran gave an outstanding performance. 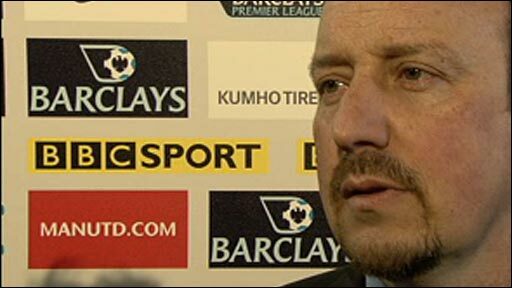 Benitez's revamped side struggled to settle early on, and it took a trademark block from Jamie Carragher to deny the industrious Park. Torres posted the warning signals for United with a turn inside the area that needed Vidic to clear. But it was United who took the lead after 23 minutes when Liverpool were punished for a rush of blood from keeper Reina, who dashed from his line and brought down Park when there appeared to be no imminent danger, Ronaldo completing the formalities from the spot. If United thought the setback would break Liverpool's resolve, they were to be sadly mistaken as Torres produced a golden spell that had them in front before the interval. He levelled after 28 minutes with an example of all the qualities that make him arguably the world's finest striker. Martin Skrtel's long clearance was speculative at best, but Torres' presence created uncertainty. Vidic let the ball bounce and Torres showed lightning speed to touch the ball away from the defender and steer a composed finish beyond Van der Sar. Torres then planted further seeds of doubt in Vidic's mind with an arrogant nutmeg on the defender, followed by respectable penalty claims when he collided with the Serb. There had been few flashpoints, but there was a swift exchange of bookings after Liverpool's Carragher tripped Carlos Tevez and Rio Ferdinand fouled Dirk Kuyt. Liverpool had ended the half in the ascendancy, and they were rewarded with the lead in the 44th minute. Torres was the creator with a clever pass inside Evra, and when Gerrard was tripped after reaching the ball first, referee Alan Wiley again got the big decision right and pointed to the spot. Gerrard tucked the penalty beyond Van der Sar, leaving Old Trafford stunned at the strength of Liverpool's fightback. United, inevitably, penned Liverpool back after the break - but found the visitors in grimly determined mood. Liverpool were fortunate to escape after 62 minutes when Ronaldo, a subdued figure throughout, found Rooney at the far post and his header flew across the face of goal with Tevez unable to apply the finishing touch. Ferguson went for broke with 18 minutes left, making a triple substitution as he sent on Dimitar Berbatov, Ryan Giggs and Paul Scholes for Anderson, Carrick and Park. But there was barely time for his changes to make a difference as United were reduced to 10 men and went further behind in the space of seconds. 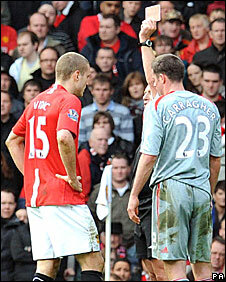 Vidic, who was also sent off at Anfield earlier this season, had suffered a harrowing afternoon, and once again his control was poor as he allowed Gerrard a clear run on goal. He chose to haul Gerrard back and the red card that followed was inevitable. As a stunned Old Trafford came to terms with that, Aurelio poured salt in the wounds with a superb 25-yard free-kick that left Van der Sar rooted to the spot. The stadium was deserting rapidly as Liverpool inflicted one final piece of punishment on United, substitute Dossena lifting a stylish finish over Van der Sar. As Liverpool's players celebrated a landmark victory, there was only misery at The Theatre of Dreams - for once an inappropriate label for the home of the champions. Man Utd: Van der Sar, O'Shea, Ferdinand, Vidic, Evra, Ronaldo, Carrick (Giggs 74), Anderson (Scholes 73), Park (Berbatov 74), Rooney, Tevez. Subs Not Used: Foster, Nani, Evans, Fletcher. Booked: Ferdinand, Van der Sar. Liverpool: Reina, Carragher, Skrtel, Hyypia, Aurelio, Mascherano, Lucas, Kuyt, Gerrard (El Zhar 90), Riera (Dossena 67), Torres (Babel 81). Subs Not Used: Cavalieri, Insua, Ngog, Arbeloa. 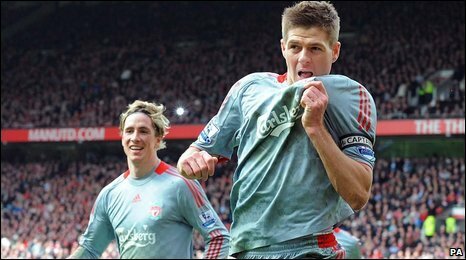 Goals: Torres 28, Gerrard 44 pen, Aurelio 77, Dossena 90. 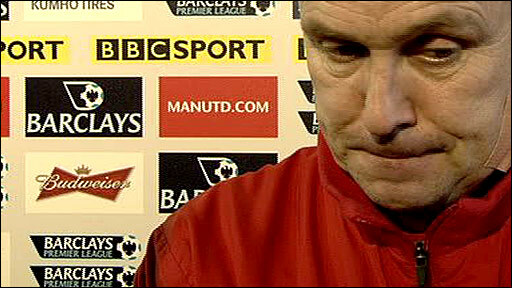 BBC Sport Player Rater man of the match: Liverpool's Fernando Torres 8.81 (on 90 minutes).